The Frankford Athletic Association was organized in May 1899 in the parlor of the Suburban Club. The cost of purchasing a share in the association was $10. However, there were also contributing memberships, ranging from $1 to $2.50, made available to the general public. The Association was a community-based non-profit organization of local residents and businesses. In keeping with its charter, which stated that "all profits shall be donated to charity", all of the team's excess income was donated to local charitable institutions. The beneficiaries of this generosity included Frankford Hospital, the Frankford Day Nursery, the local Boy Scouts, and the local American Legion Post 211. The officers of the Association never received a salary or compensation for their work on behalf of the team. The association's clubhouse was originally located at the current site of Frankford High School. The field at this site, known as Wistar Field, became the first official home of the Yellow Jackets. Several years later, when the construction of the current high school was proposed, the team moved to Brown's Field. The Association initially fielded a baseball team, however soccer and football clubs were also formed. The Association's football team played several games in 1899, including victorious contests against the Pioneer Athletic Association, Jefferson Medical College, the Philadelphia Athletic Club, and a team from Atlantic City. The original Frankford Athletic Association apparently disbanded prior to the 1909 football season. Several of the original players from the 1899 football team kept the team together, and they became known as Loyola Athletic Club. In keeping with Yellow Jackets tradition, they carried the "Frankford" name again in 1912, to become the Frankford Athletic Association. For more details on this topic, see 1925 NFL Championship controversy. 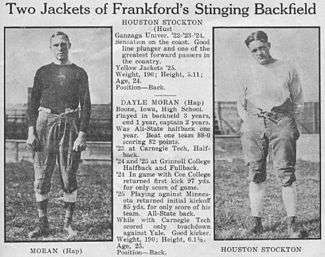 The Yellow Jackets began the 1926 season with an exhibition game against the Atlantic City Roses, which Frankford won 45–0. Their NFL campaign started just six days later, in a disappointing 6–6 tie at home against the Akron Pros. The first weekend in October saw the club post two solid victories over the Hartford Blues. They then played a two-game series against the Buffalo Rangers. During the Saturday game, the Yellow Jackets defeated the Rangers 30–0 in Frankford. The Jackets then headed to Buffalo for the Sunday game; however, the Rangers canceled due to "wet grounds". The Yellow Jackets prepared for another two-game set, this time against the New York Giants, resulting in a pair of 6–0 Frankford victories. The Canton Bulldogs were next on the schedule; Frankford won the first game 10–0, while the second game was canceled due to rain. During the final weekend of October, the Yellow Jackets had a league-leading 6–0–1 record. However they had an upcoming two-game set with their toughest opponent yet, the Providence Steam Roller. The Yellow Jackets managed to split the series. The team's November schedule included only single-game weekends, and a Thanksgiving Day game. This played to the Yellow Jackets’ advantage. The team posted victories over the Chicago Cardinals, Duluth Eskimos, and Dayton Triangles. This string of victories left Frankford in great shape in the standings as the team headed into its Thanksgiving Day game with the Green Bay Packers. For the next five seasons the Frankford-Green Bay Thanksgiving Day game would become an annual tradition. Frankford went on to win the game 20–14, due mainly to a touchdown pass from Hust Stockton to Two-Bits Homan. The Yellow Jackets then posted a 7–6 victory over the Detroit Panthers two days later. After a win over the Chicago Bears, the Yellow Jackets played a second two-game series against the Providence Steamroller. Frankford won the first game 24–0, but the second was cancelled because of heavy snow. Frankford then had to play their final game of the season against the Pottsville Maroons, who were still upset after their NFL championship title had been stripped from them after complaints from Frankford. The game resulted in a scoreless tie. However, a 14–1–2 final record left the Yellow Jackets alone atop the NFL standings. Since a Championship Game would not exist in the NFL until 1933, the team with the best regular season record was named the NFL Champion. This gave the Yellow Jackets undisputed claim to the league crown. The Jackets' 14 wins during the 1926 championship season set an NFL record for regular season victories that stood until 1984, when it was broken by the 15–1–0 San Francisco 49ers. One day after capturing the title, however, Theodore "Thee" Holden and Guy Chamberlin stepped down as president and coach of the Frankford Athletic Association. Before the start of the 1931 season, Frankford Stadium was severely damaged by a fire, forcing the club to find another location for its home games. However, most facilities suitable for professional football were already booked. The Yellow Jackets had to overcome this scheduling problem by playing at three different locations around the city of Philadelphia: Philadelphia Municipal Stadium, and Baker Bowl. Philadelphia Municipal Stadium and Shibe Park were located outside of the Frankford area, making attendance difficult for local fans. The team had hoped to draw broader support from Philadelphia at large. Herb Joesting took over as head coach in 1931. However the team was in terrible shape. Some members of the press began referring to the team as the Philadelphia Yellow Jackets, in an attempt to increase fan support, which failed to materialize. By October, NFL President Joe Carr, after witnessing the poor attendance at Frankford's home loss to the Portsmouth Spartans, approved a plan for the Yellow Jackets to finish the season as a traveling team. Carr hoped that this move would allow the team to curb spending and rebound financially. On October 26, 1931, the Yellow Jackets defeated the Chicago Bears, 13–12, at Wrigley Field. This game marked the last time a Philadelphia-based NFL team would win an away game over the Bears until October 17, 1999, when the Eagles defeated the Bears 20–16 at Soldier Field. The 1928 Yellow Jackets win over the Packers marked the last time in 51 years a Philadelphia NFL team won a road victory over the Packers; the Eagles' 1979 win at Green Bay finally ended that streak. The Frankford Athletic Association not only fielded the Yellow Jackets football team, but also the Yellow Jackets' Band and the Frankford Legion Post 211 Drum & Bugle Corps. The Association also sponsored bus and train trips for fans to travel along to games in such places as Pottsville and New York City, where even the host teams' sportswriters took notice of their enthusiasm. The club occasionally sponsored half-time exhibitions by the Frankford Midgets, as well as a women's football team. During their time in the NFL, Frankford's Ignacio Molinet became the league's first Latino player. Today the Philadelphia Fire Department's Engine 14, stationed in Frankford, have adopted the Yellow Jackets moniker on their fire trucks. The victory over the Bears would be the last game the Yellow Jackets played. The Yellow Jackets suspended operations the following day. Unable to find a buyer, the Frankford Athletic Association returned the franchise to the league. The NFL spent over a year searching for a new team to operate in Philadelphia. On July 9, 1933, the NFL granted an expansion franchise to Bert Bell and Lud Wray and awarded them the assets of the failed Yellow Jackets organization. Bell and Wray named their team the Philadelphia Eagles, after the symbol of Franklin Roosevelt's New Deal. This has led to assumptions that the Yellow Jackets changed their name to the Eagles and returned to the league after sitting out the 1932 season. However, that is not the case. Bell and Wray did not buy the Yellow Jackets team, but rather the NFL rights to the Philadelphia area that formerly had belonged to the Frankford Athletic Association. Due to the period of dormancy, the Eagles do not claim the Yellow Jackets' history as their own, and the NFL considers the Eagles a 1933 expansion team for record-keeping purposes. Additionally, Bell and Wray assembled an almost entirely new team; only one player from the 1931 Yellow Jackets ended up with the 1933 Eagles. For the first few years of the Eagles' existence, however, they wore powder blue and yellow uniforms similar to those worn by the Yellow Jackets; these are also the colors of Philadelphia's flag. Replicas were later worn as 1934 throwbacks in a game against the Detroit Lions on September 23, 2007 as part of the team's 75th anniversary season. Many members of the media mistakenly stated that the Eagles were still known as the Yellow Jackets that year. Wikimedia Commons has media related to Frankford Yellow Jackets.